Protection Systems, Inc. has installed thousands of home security systems in the Piedmont area. We have qualified system engineers that will design a security system that will benefit your family to the highest potential of the latest technology. From simple security systems to the state of the art camera systems, Protection Systems, Inc. has what your family will need to feel safe and secure in your home. Protection Systems, Inc. works with you to suit all your business needs from working with you during the planning stage of your new building to installing systems in already existing buildings. We install fire alarms, CCTV and burglar alarms meeting all of the fire and building codes for your area. We provide businesses and homes with complete closed circuit TV coverage. We have provided CCTV for a number of schools, homes and businesses in the area. 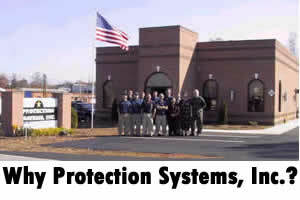 We can design a system that will protect you, your property, and your business. We also provide the largest commercial buildings with an IP video system that rivals any HD picture you have ever seen. We have systems that can email video clips of events and allow you to check in on your property from anywhere in the world, all you need is a PC or smartphone and the internet. We also offer I-View Now. In the event of an alarm a video clip is sent to our central station and to your smart phone, then we can see what caused the alarm just as well as you! Just check the clip and if it's someone you know call the central station and let them know. If it is not anyone allowed on the premise we can dispatch immediately. Protection Systems, Inc. can give your company the security that comes with controlling access into and within your facility with our full line of access control products. We have systems that range from a single door with several users to multi-story buildings with many different tenants. We also install other types of Access Control systems such as area of rescue and nurse call systems. We can provide detailed information about who is entering your building and when. We feature equipment from all the major access control manufacturers like Honeywell®, KeyScan®, Corby®, and IEI®. Since we are an independent dealer, we have the advantage of choosing the right product for your needs and designing a system that is right for you. 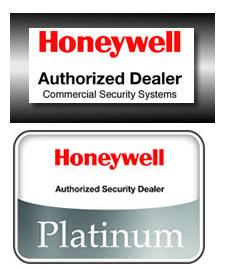 Protection Systems Inc. features web based access control systems from Honeywell®. We can provide a single door solution or a multi-door managed access control system that we can manage for you. Call us for your access control needs and we can design a system that fits. Protection Systems, Inc. protects thousands of clients from the destruction that occurs when a fire happens. Our systems provide that early warning during the first stages of a fire so the authorities can be alerted and the fire controlled. We know fire systems! We perform NFPA 72 fire inspections and we are NICET certified. Controlling one of life's most tragic events is a top priority for Protection Systems, Inc.
Protection Systems Inc. started installing alarm systems in 1970; in 1978 the central station was established. Our central station has personnel on duty serving our customers 24/7. We only monitor our own accounts and we are right here in High Point. Local Monitoring sets us apart. When you choose Protection Systems Inc. to monitor your security system you will be relying on a company that knows your community. Call us today to take care of your security needs 336-841-8685.